One of my favorite things to order at Ladurée are their French toasts with Chantilly cream. They're heavenly delicious and filling - two toasts and some Marie Antoinette tea, and you're ready to explore all the lovely boutiques situated around Opéra and Église de la Madeleine. In the land of baguettes and croissants, French toasts are known as le pain perdu, which literally translates as "lost bread". And nope, no bread was lost in the making - quite the opposite! Soaking bread slices in the mixture of eggs and milk is one of the easiest ways to make use of a slightly stale bread - besides, stale bread will less likely fall apart in the process. 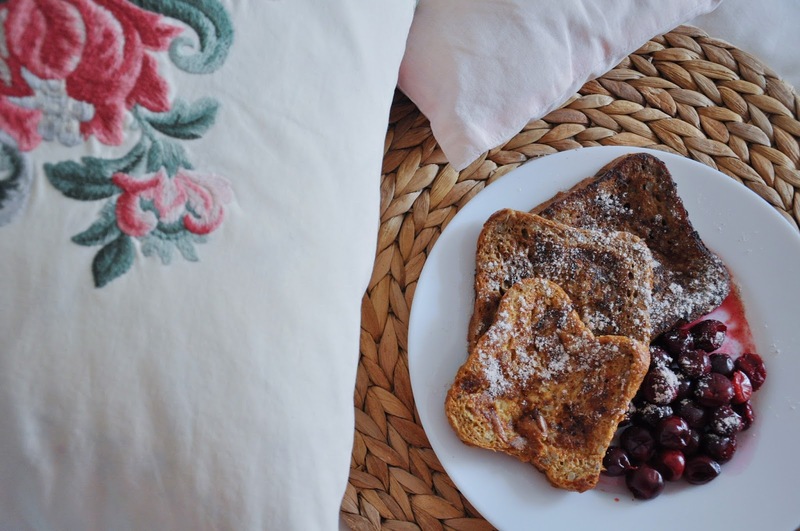 French toasts are perfect for Sunday morning breakfasts, as they are easily cooked and do not require any hard-to-find or pricey ingredients. So whether you're making breakfast just for yourself or for five hungry mouths, I highly recommend trying it out this weekend (and in case you prefer regular toasts, spice up your morning with this Eiffel Tower bread stamper). Whisk together the eggs, milk, cinnamon and vanilla extract. Then spray some cooking spray over a non-stick frying pan and heat it over medium heat. Dip the bread slices in the egg and milk mixture, evenly covering both sides. Cook until lightly brown (2-3 minutes on each side). Serve with berries and the sweetener of choice. How do you like eating your French toasts?